Down syndrome (DS) is the most common cause of mental retardation and malformation in a newborn. It occurs because of the presence of an extra chromosome. It was first described in 1866 by Dr. John L. H. Down (1828–1896), an English physician. Down syndrome occurs about once in every 800 births. It is estimated that about 6,000 children are born with DS each year in the United States. Chromosomes are the units of genetic information that exist within every cell of the body. Twenty-three distinctive pairs, or 46 total chromosomes, are located within the nucleus (central structure) of each cell. When a baby is conceived by the combining of one sperm cell with one egg cell, the baby receives 23 chromosomes from each parent, for a total of 46 chromosomes. Sometimes, an accident in the production of a sperm or egg cell causes that cell to contain 24 chromosomes. This event is referred to as nondisjunction. When this defective cell is involved in the conception of a baby, that baby will have a total of 47 chromosomes. The extra chromosome in Down syndrome is labeled number 21. For this reason, the existence of three such chromosomes is sometimes referred to as trisomy 21. In a very rare number of Down syndrome cases (about 1-2%), the original egg and sperm cells are completely normal. The problem occurs sometime shortly after fertilization; during the phase where cells are dividing rapidly. One cell divides abnormally, creating a line of cells with an extra chromosome 21. This form of genetic disorder is called a mosaic. The individual with this type of Down syndrome has two types of cells: those with 46 chromosomes (the normal number), and those with 47 chromosomes (as occurs in Down syndrome). Some researchers have suggested that individuals with this type of mosaic form of Down syndrome have less severe signs and symptoms of the disorder. Another relatively rare genetic accident which can cause Down syndrome is called translocation. During cell division, the number 21 chromosome somehow breaks. A piece of the 21 chromosome then becomes attached to another chromosome. Each cell still has 46 chromosomes, but the extra piece of chromosome 21 results in the signs and symptoms of Down syndrome. Translocations occur in about 3-4% of cases of Down syndrome. Down syndrome occurs in about one in every 800-1,000 births. It affects an equal number of boys and girls. Less than 25% of Down syndrome cases occur due to an extra chromosome in the sperm cell. The majority of cases of Down syndrome occur due to an extra chromosome 21 within the egg cell supplied by the mother (nondisjunction). As a woman's age (maternal age) increases, the risk of having a Down syndrome baby increases significantly. For example, at younger ages, the risk is about one in 4,000. By the time the woman is age 35, the risk increases to one in 400; by age 40 the risk increases to one in 110; and by age 45 the risk becomes one in 35. There is no increased risk of either mosaicism or translocation with increased maternal age. Down syndrome sometimes occurs together with such other developmental disorders as Rett syndrome. Although such double diagnoses are very rare, it is important for parents to recognize that the presence of one chromosomal abnormality does not exclude the possibility that their child may have a second anomaly. 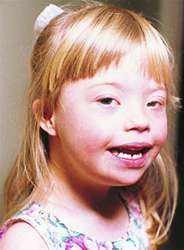 Other types of defects often accompany Down syndrome. About 30-50% of all children with Down syndrome are found to have heart defects. A number of different heart defects are common in Down syndrome, including abnormal openings (holes) in the walls that separate the heart's chambers (atrial septal defect, ventricular septal defect). These result in abnormal patterns of blood flow within the heart. The abnormal blood flow often means that less oxygen is sent into circulation throughout the body. Another heart defect that occurs in Down syndrome is called Tetralogy of Fallot. Tetralogy of Fallot consists of a hole in the heart, along with three other major heart defects. Malformations of the gastrointestinal tract are present in about 5-7% of children with Down syndrome. The most common malformation is a narrowed, obstructed duodenum (the part of the intestine into which the stomach empties). This disorder, called duodenal atresia, interferes with the baby's milk or formula leaving the stomach and entering the intestine for digestion. The baby often vomits forcibly after feeding, and cannot gain weight appropriately until the defect is repaired. Other medical conditions that occur in patients with Down syndrome include an increased chance of developing infections, especially ear infections and pneumonia; certain kidney disorders; thyroid disease (especially low or hypothyroid); hearing loss; vision impairment requiring glasses (corrective lenses); and a 20-times greater chance of developing leukemia (a blood disorder). Development in a baby and child with Down syndrome occurs at a much slower than normal rate. Because of weak, floppy muscles (hypotonia), babies learn to sit up, crawl, and walk much later than their normal peers. Talking is also quite delayed. The level of mental retardation is considered to be mild-to-moderate in Down syndrome. The actual IQ range of Down syndrome children is quite varied, but the majority of such children are in what is sometimes known as the trainable range. This means that most people with Down syndrome can be trained to do regular self-care tasks, function in a socially appropriate manner in a normal home environment, and even hold simple jobs. As people with Down syndrome age, they face an increased chance of developing the brain disease called Alzheimer's (sometimes referred to as dementia or senility). Most people have a six in 100 risk of developing Alzheimer's, but people with Down syndrome have a 25 in 100 chance of the disease. In addition to an increased risk of developing Alzheimer's, patients with DS show the first signs of the disease much earlier than most people, often in their early 40s. Alzheimer's disease causes the brain to shrink and to break down. The number of brain cells decreases, and abnormal deposits and structural rearrangements occur. This process results in a loss of brain functioning. People with Alzheimer's have strikingly faulty memories. Over time, people with Alzheimer's disease will lapse into an increasingly unresponsive state. Some researchers have shown that even Down syndrome patients who do not appear to have Alzheimer's disease have the same changes occurring to the structures and cells of their brains. A new questionnaire was published in 2004 to help doctors evaluate adults with Down syndrome for symptoms of Alzheimer's-related dementia. As people with Down syndrome age, they also have an increased chance of developing a number of other illnesses, including cataracts, thyroid problems, diabetes, and seizure disorders. Diagnosis is usually suspected at birth, when the characteristic physical signs of Down syndrome are noted. Once this suspicion has been raised, genetic testing (chromosome analysis) can be undertaken in order to verify the presence of the disorder. This testing is usually done on a blood sample, although chromosome analysis can also be done on other types of tissue, including skin. The cells to be studied are prepared in a laboratory. Chemical stain is added to make the characteristics of the cells and the chromosomes stand out. Chemicals are added to prompt the cells to go through normal development, up to the point where the chromosomes are most visible, prior to cell division. At this point, they are examined under a microscope and photographed. The photograph is used to sort the different sizes and shapes of chromosomes into pairs. In most cases of Down syndrome, one extra chromosome 21 will be revealed. The final result of such testing, with the photographed chromosomes paired and organized by shape and size, is called the individual's karyotype. No treatment is available to cure Down syndrome. Treatment is directed at addressing the individual concerns of a particular patient. For example, heart defects will many times require surgical repair, as will duodenal atresia. Many Down syndrome patients will need to wear glasses to correct vision. Patients with hearing impairment benefit from hearing aids. A drug known as piracetam received some attention in the treatment of Down syndrome patients in the mid-1990s. Piracetam is a so-called "smart drug" that is marketed in Europe and Japan to normal adults hoping to increase their cognitive abilities. It is also sold to skiers and mountain climbers as a remedy for loss of concentration at high altitudes. Although some European researchers have studied piracetam as a possible treatment for dementia in Alzheimer's disease, none of these trials have shown as of 2004 that the drug is of any benefit to Alzheimer's patients. Piracetam is not approved for use in the United States; several large shipments of it were seized by the Food and Drug Administration in 2004. Piracetam can be obtained via the Internet but is not recommended by mainstream medical practitioners. In 1998 the European company licensed to produce piracetam, UCB Pharma in Belgium, issued a statement discouraging its use in children with Down syndrome. The company obtained orphan drug status for piracetam from the FDA in the early 2000s and has conducted a controlled trial of the drug as a possible treatment for muscle spasms (myoclonus) in children. While some decades ago, all Down syndrome children were quickly placed into institutions for lifelong care. Research shows very clearly that the best outlook for children with Down syndrome is a normal family life in their own home. This approach, however, requires careful support and education of the parents and the siblings. It is a life-changing event to learn that a new baby has a permanent condition that will effect essentially all aspects of his or her development. Some community groups exist to help families deal with the emotional effects of this new information, and to help plan for the baby's future. Schools are required to provide services for children with Down syndrome, sometimes in separate special education classrooms, and sometimes in regular classrooms. This educational practice is called mainstreaming or inclusion. The prognosis in Down syndrome is quite variable, depending on the types of complications (heart defects, susceptibility to infections, development of leukemia) of each individual baby. The severity of the retardation can also vary significantly. Without the presence of heart defects, about 90% of children with Down syndrome live into their teens. People with Down syndrome appear to go through the normal physical changes of aging more rapidly, however. The average age of death for an individual with Down syndrome is about 50-55 years. The most common cause of death is heart disease. Still, the prognosis for a baby born with Down syndrome in the early 2000s is better than ever before. Because of modern medical treatments, including antibiotics to treat infections and surgery to treat heart defects and duodenal atresia, life expectancy has greatly increased. Community and family support allows people with Down syndrome to have rich, meaningful relationships. Because of educational programs, some people with Down syndrome are able to hold jobs. Men with Down syndrome appear to be uniformly sterile (meaning that they are unable to have offspring). Women with Down syndrome, however, are fully capable of having babies. About 50% of these babies, however, will also be born with Down syndrome. Efforts at prevention of Down syndrome are aimed at genetic counseling of couples who are preparing to have babies. A counselor needs to inform a woman that her risk of having a baby with Down syndrome increases with her increasing age. Two types of testing is available during a pregnancy to determine if the baby being carried has Down syndrome. Screening tests are used to estimate the chance that an individual woman will have a baby with Down syndrome. At 14-17 weeks of pregnancy, measurements of a substance called AFP (alpha-fetoprotein) can be performed. AFP is normally found circulating in the blood of a pregnant woman, but may be unusually high or low with certain disorders. Carrying a baby with Down syndrome often causes AFP to be lower than normal. This information alone, or along with measurements of two other hormones, is considered along with the mother's age to calculate the risk of the baby being born with Down syndrome. These results are only predictions, and are only correct about 60% of the time. The only way to definitively establish (with about 98-99% accuracy) the presence or absence of Down syndrome in a developing baby, is to test tissue from the pregnancy itself. This is usually done either by amniocentesis or chorionic villus sampling (CVS). In amniocentesis, a small amount of the fluid in which the baby is floating is withdrawn with a long, thin needle. In chorionic villus sampling, a tiny tube is inserted into the opening of the uterus to retrieve a small sample of the placenta (the organ that attaches the growing baby to the mother via the umbilical cord, and provides oxygen and nutrition). Both amniocentesis and CVS allow the baby's own karyotype to be determined. A couple must then decide whether to use this information in order to begin to prepare for the arrival of a baby with Down syndrome, or to terminate the pregnancy. Once a couple has had one baby with Down syndrome, they are often concerned about the likelihood of future offspring also being born with the disorder. Most research indicates that this chance remains the same as for any woman at a similar age. However, when the baby with Down syndrome has the type that results from a translocation, it is possible that one of the two parents is a carrier of that defect. A carrier conveys the genetic defect to the next generation but does not actually have the disorder. When one parent is a carrier of a translocation, the chance of future offspring having Down syndrome is greatly increased. The specific risk requires evaluation by a genetic counselor. Chromosome — The structures that carry genetic information. Chromosomes are located within every cell, and are responsible for directing the development and functioning of all the cells in the body. The normal number is 46 (23 pairs). Karyotype — The specific chromosomal makeup of a particular cell. Mental retardation — A condition where an individual has a lower-than-normal IQ, and thus is developmentally delayed. Mosaic — A term referring to a genetic situation, in which an individual's cells do not have the exact same composition of chromosomes. In Down syndrome, this may mean that some of the individual's cells have a normal 46 chromosomes, while other cells have an abnormal 47 chromosomes. Nondisjunction — A genetic term referring to an event which takes place during cell division, in which a genetic accident causes an egg or sperm cell to have 24 chromosomes, rather than the normal 23. Orphan drug — A term for a drug that treats a rare disease, defined by the Food and Drug Administration (FDA) as one that affects fewer than 200,000 Americans. The FDA has an Office of Orphan Products Development (OOPD), which offers grants to researchers to develop these products. Translocation — A genetic term referring to a situation during cell division in which a piece of one chromosome breaks off and sticks to another chromosome. Trisomy — The condition of having three identical chromosomes instead of the normal two. Beers, Mark H., MD, and Robert Berkow, MD, editors. "Congenital Anomalies." Section 19, Chapter 261 In The Merck Manual of Diagnosis and Therapy. Whitehouse Station, NJ: Merck Research Laboratories, 2004. Tierney, Lawrence, et al. Current Medical Diagnosis and Treatment. Los Altos, CA: Lange Medical Publications, 2001. Chen, Harold, MD. "Down Syndrome." eMedicine December 6, 2004. http://www.emedicine.com/med/topic567.htm. Egan, J. F., P. A. Benn, C. M. Zelop, et al. "Down Syndrome Births in the United States from 1989 to 2001." American Journal of Obstetrics and Gynecology 191 (September 2004): 1044-1048. Evans, J. G., G. Wilcock, and J. Birks. "Evidence-Based Pharmacotherapy of Alzheimer's Disease." International Journal of Neuropsychopharmacology 7 (September 2004): 351-369. Leonard, H., L. Weaving, P. Eastaugh, et al. "Trisomy 21 and Rett Syndrome: A Double Burden." Journal of Paediatrics and Child Health 40 (July 2004): 406-409. Prasher, V., A. Farooq, and R. Holder. "The Adaptive Behaviour Dementia Questionnaire (ABDQ): Screening Questionnaire for Dementia in Alzheimer's Disease in Adults with Down Syndrome." Research in Developmental Disabilities 25 (July-August 2004): 385-397. Tanner, Lindsey. "Study: Drug May Hurt Syndrome Kids." Chicago: Associated Press April 12, 2001. Tyler, C., and J. C. Edman. "Down Syndrome, Turner Syndrome, and Klinefelter Syndrome: Primary Care throughout the Life Span." Primary Care 31 (September 2004): 627-648. National Down Syndrome Congress. 1605 Chantilly Drive, Suite 250, Atlanta, GA 30324-3269. (800) 232-6372. National Down Syndrome Society. 666 Broadway, 8th Floor, New York, NY 10012-2317. (800) 221-4602. http://www.ndss.org. National Organization for Rare Disorders (NORD). 55 Kenosia Avenue, P. O. Box 1968, Danbury, CT 06813-1968. (203) 744-0100. Fax: (203) 798-2291. http://www.rarediseases.org. United States Food and Drug Administration (FDA). 5600 Fishers Lane, Rockville, MD 20857-0001. (888) INFO-FDA. http://www.fda.gov. Food and Drug Administration (FDA). "Grants Awarded by the OOPD Program." http://www.fda.gov/orphan/grants/previous.htm. Food and Drug Administration (FDA). "Refusal Actions by FDA as Recorded in OASIS for China (Mainland). August 2004." http://www.fda.gov/ora/oasis/1/ora_oasis_c_cn.html. Leshin, Lem, MD. "Piracetam and Down Syndrome." http://www.ds-health.com/piracet.html. a congenital condition characterized by physical malformations and some degree of mental retardation; it was formerly known as mongolism because the patient's facial characteristics resemble those of persons of the Mongolian race. It is also called trisomy 21 syndrome because the disorder is concerned with a defect in chromosome 21. Causes are not known. There is a relatively high incidence in children of mothers in the older childbearing age, especially older than age 40. A particular type of the syndrome, seen in children of younger mothers, seems to have a tendency to occur in certain families. The term trisomy refers to the presence of three representative chromosomes in a cell instead of the usual pair. In Down syndrome the twenty-first chromosome pair fails to separate when the germ cell (usually the ovum) is being formed. Thus the ovum contains 24 chromosomes, and when it is fertilized by a normal sperm carrying 23 chromosomes, the child is born with an extra chromosome (or total of 47) per cell. Although not all of the physical characteristics of Down syndrome are always found in a child experiencing this disorder, there usually is a combination of several of them so that diagnosis at birth can be made without difficulty. These characteristics include a small, flattened skull, a short, flat-bridged nose, wide-set eyes, epicanthus, a protruding tongue that is furrowed and lacks a central fissure, short, broad hands and feet with a wide gap between the first and second toes, and a little finger that curves inward. The muscles are hypotonic and there is excessive mobility of the joints. The genitalia are often underdeveloped and congenital heart defects sometimes occur. The National Down Syndrome Society maintains an informative web site at http://www.ndss.org. Their mailing address is National Down Syndrome Society, 666 Broadway, New York NY 10012. 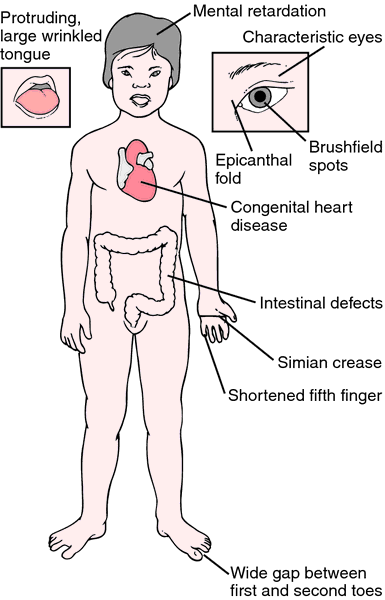 Typical features of Down syndrome. From Damjanov, 1996. (See Atlas 1, Part D). a chromosomal dysgenesis syndrome consisting of a variable constellation of abnormalities caused by triplication or translocation of chromosome 21. The abnormalities include mental retardation, retarded growth, flat hypoplastic face with short nose, prominent epicanthic skin folds, small low-set ears with prominent antihelix, fissured and thickened tongue, laxness of joint ligaments, pelvic dysplasia, broad hands and feet, stubby fingers, and transverse palmar crease. Lenticular opacities and heart disease are common. The incidence of leukemia is increased and Alzheimer disease is almost inevitable by age 40 years. A congenital disorder caused by the presence of an extra 21st chromosome and marked usually by moderate to severe intellectual disabilities, short stature, and a flattened facial profile. Also called trisomy 21.
a congenital condition characterized by varying degrees of mental retardation and multiple defects. It is the most common chromosomal abnormality of a generalized syndrome and is caused by the presence of an extra chromosome 21 in the G group or, in a small percentage of cases, by the translocation of chromosome 14 or 15 in the D group and chromosome 21 or 22. Down syndrome occurs in approximately 1 in 600 to 650 live births and is associated with advanced maternal age, particularly over 35 years of age. The incidence is as high as 1 in 80 for offspring of women above 40 years of age. In cases caused by translocation, which is a genetic aberration that is hereditary rather than a chromosomal aberration caused by nondisjunction during cell division, the incidence is not associated with maternal age, and the risk is low, about 1 in 5 if the mother is the carrier and 1 in 20 if the father is the carrier. The condition can be diagnosed prenatally by amniocentesis. A mosaic variant, in which there is a mixture of trisomy 21 and normal cells, causes fewer physical defects and less severe retardation, depending on the degree of mosaicism. Infants with the syndrome are small and hypotonic, with characteristic microcephaly, brachycephaly, a flattened occiput, and typical facies with a mongoloid slant to the eyes, depressed nasal bridge, low-set ears, and a large, protruding tongue that is furrowed and lacks a central fissure. The hands are short and broad with a transverse palmar or simian crease; the fingers are stubby and show clinodactyly, primarily of the fifth finger. The feet are broad and stubby with a wide space between the first and second toes and a prominent plantar crease. Other anomalies associated with the disorder are bowel defects, congenital heart disease (primarily septal defects), chronic respiratory infections, visual problems, abnormalities in tooth development, and susceptibility to acute leukemia. The most significant feature of the syndrome is mental retardation, which varies considerably. The average IQ is in the range of 50 to 60, so that the child is generally trainable and in most instances can be reared at home. The mortality rate is high within the first few years, especially in children with cardiac anomalies. Those who survive tend to be shorter than average and stocky in build; they show delayed or incomplete sexual development and can live to middle or old age, although adults with Down syndrome are prone to respiratory infections, pneumonia, and lung disease. Formerly called mongolism. Also called trisomy 21. See also nondisjunction. Chromosome 21 syndrome, mongolism, trisomy 21 Pediatrics A chromosome disorder, first described by Langdon Down, due to an extra chromosome 21–trisomy 21 Clinical Mental retardation, characteristic facies, multiple malformations, major congenital heart defects, duodenal atresia, acute leukemia, ↑ risk of pneumonia, other infections Prenatal screening ↓ Maternal serum AFP levels, ↓ unconjugated etriol, ↑ chorionic gonadotropin. See Triple marker test. A chromosomal dysgenesis syndrome consisting of a variable constellation of abnormalities caused by triplication or translocation of chromosome 21. The abnormalities include mental retardation, retarded growth, flat hypoplastic face with short nose, prominent epicanthic skin folds, small, low-set ears with prominent antihelix, fissured and thickened tongue, laxness of joint ligaments, pelvic dysplasia, broad hands and feet, stubby fingers, and transverse palmar crease. Lenticular opacities and heart disease are common. The incidence of leukemia is increased and onset of Alzheimer disease is almost inevitable by age 40. John Langdon H., English physician, 1828-1896. A chromosomal dysgenesis syndrome consisting of a variable constellation of abnormalities caused by triplication or translocation of chromosome 21. The abnormalities include mental retardation, retarded growth, flat hypoplastic face with short nose, prominent epicanthic skin folds, small low-set ears with prominent antihelix, fissured and thickened tongue, laxness of joint ligaments, pelvic dysplasia, broad hands and feet, stubby fingers, and transverse palmar crease. mongolism is no longer used. All Down's experts agree children may suffer allergic reactions to injections of cells taken from animal tissue. Most scientists involved in the issue agree the therapy has not been put to an airtight test, but they say the existing data show the treatment is powerless to improve symptoms of Down's syndrome. 14 LANCET, found that levels of biochemical indicators of neurotransmitter function are greatly decreased in both Alzheimer's patients and older Down's patients. Using a custom-built, genetically engineered mouse model of down's syndrome (SN: 10/13/84, p.
Right now it's only speculation," McManaman says, "but the evidence is good that trophic factors may be involved in both Alzheimer's and Down's syndrome. Nerve growth factor's role in Down's and Alzheimer's in unclear, but the Baylor and Cornell studies suggest it affects both fetal brain development (disturbed in Down's) and maintenance of healthy adult brain fucntion (lost in Alzheimer's). At the center of the abnormalities common to Alzheimer's and Down's is the hippocampus. Although Down's patients handle some cognitive tasks better than do other mentally handicapped individuals, they, like Alzheimer's victims, have difficulty in abstract thinking, certain types of memory and tasks involving spatial perception. Nor is it clear that many older Down's patients actually develop the debilitating clinical dementia; it has been difficult to assess demented behavior in mentally handicapped individuals. Even more compelling to Nadel, Lott and others is the potential for intervention in Down's syndrome. studying stimulated and nonstimulated Down's patients. Although controversial, interpretation of data from several research groups could mean that the brain's "wiring" is improved in stimulated Down's patients through increased cortical thickness and synaptic density.